I am just preparing a presentation on “How to be a Great Surgical Trainer”. Im sure like trainers in every other profession or sector, surgeons would like the answer to be….use this font, ask a good question and then keep on doing what you’re doing and what was done to you. We tend to keep on asking the same question until someone gives us the answer we want. Cathy, these blogs and emails are priceless….a huge thank you. Is there a test you can take to check whether you are a nasal learner??? I want to be one! Typically I would agree with your arguments and the literature, and in general for the most of the population, these arguments are probably valid, however, having a learning disabled (LD) child has given me a new perspective. Additionally, I have two autistic nephews – one more high functioning and the other scoring in the genius level for IQ but not as high functioning. I can’t explain why, but I can tell you my child and both my nephews, all of which processes learning materials very differently and as a direct result, each of their learning outcomes vary significantly depending on how the material is presented, the delivery method and by whom is presenting the material. One could argue that these are just elements and aren’t truly learning styles, but I’ve seen many definitions and all of which encompass suggestions or attributes of presentation and delivery. Regardless of the jargon, these children, will someday hold jobs and be self supporting and have to comply with company trainings. Their LDs will be life-long and while I would say its impossible to make learning adaptable for every human being’s preferred method of receiving instruction to achieve the best outcomes, I do believe as and instructional designer, just as one would do for other disabilities (i.e.deaf/blind), we need to ask these questions up front in the needs assessment to get a better understanding of the audience(s) and whether or not special considerations need to be made to fully comply with federal disability laws. I’ve read before about people making the distinction between a preferred “learning style” and an ability, or lack thereof. The same way I would not consider a deaf person to have a “visual learning style,” I don’t think we can consider other disabilities to equate to a learning style that corresponds with their ability. I have the same anecdotal experiences with my own children and having trained accountants and chefs, I can say that in general, what works for one group would not work as well for the other. I also find it helpful to add options for people who need to see the whole picture and fit the parts into the whole vs. those who prefer to learn linearly. My guess is that there will be a bit of a backlash to the studies after a while. That being said, I do find action mapping to be a better solution than much is what is out there regardless of the approach. Hi! Great post as always. I’ve seen a great deal of discussions around “learning styles” and whether or not they are “real”. The problem is most people feel they learn in a certain way so it becomes negative when you try to direct them away from the idea. Instead of debating I incorporate Universal Design for Learning into my course design. UDL is a curriculum design framework used to develop learning environments that are accessible and beneficial to a wide variety and range of learners with the goal of creating expert learners. The research and neuroscience around UDL support its use. (www.cast.org) UDL is often viewed as an accessibility framework, which it is, but that is just the low-lying fruit. UDL encourages the design of flexible pathways for learning, the inclusion of metacognitive and reflexive practices, scaffolding and support as well as options and choice. So I’d have to disagree that “The content and nature of the task should determine the media.” We need to design for the variability of the learner, recognizing that one means of access is not enough. Too often the means and method is the author’s preference rather than the needs of the learner. In any learning environment, one size does not fit all and as such we need to ensure all information is accessible by providing options and choice; and all learning is accessible by designing flexible pathways and personal choice. UDL addresses course design and has a great research basis. I suggest this approach, since it incorporates multiple pathways for learners. After reading a 500+ pages research overview in “The big book of concepts” (MIT press 2004) the authors leave me alone with their idea that they still do not know how concepts are stored in the brain. Kendra, thank you for sharing the information about UDL. I’ve never heard of it before till now and will definitely look more into it. I also agree with you in how you mentioned how we should design for the variability of the learner! Yes, we definitely need to adapt curricula, resources, and learning activities to best help people with learning disabilities. There are methods, approaches, strategies, and techniques that are coherent, evidence-based, well-developed, and have plenty of practitioner support available. Great article as usual. I have been in the debunk camp for some time with regards to the VAK styles. I was recently doing a session on workplace training for frontline managers (this was a face-to-face session). Anyway, one of the topics was about a learning cycle – specifically Kolb’s learning cycle and the associated learning styles. My mental space going in was to talk about how the cycle might manifest itself within training – but to tell people not to worry about the style preferences. But then it occurred to me while I was doing background reading that in fact I did find some value in these learning styles. I think it was the link to the cycle. For example, I will naturally find my comfort space as a watcher and a thinker. So if I take myself as an example learner, my reflection as a learning designer will be around how do I design opportunities for me to do what I am comfortable with and then to push me into what I am not as naturally happy doing. In other words, if someone is coming from XYZ space, how can I connect with them so they are open to the experience and then, am I pushing them (or how can I push them) to a space where they will maximise learning (NZ spelling). Anyway, these are new and recent thoughts I have had – and as yet they are not terribly well thought out, but I would be interested in other thoughts on this. It is unreasonable to expect teaching practitioners to be competent scientists too. The scientific method, i.e. the method of identifying and compensating for our natural cognitive biases that lead us to very believable but erroneous conclusions, is a difficult skill set to master and time-consuming and laborious to use. We shouldn’t expect teachers to come up with coherent, comprehensive, well-designed experiments to see if their hypotheses about their teaching practice are correct – that’s why we have education researchers. Although anecdotal evidence, i.e. teaching practitioners’ experience, is a wonderful and very fruitful start down the road of interesting and potentially valuable lines of inquiry, it should never be taken as conclusive evidence. “There are two ways that a teacher might see what looks like evidence for modality theory in the classroom. First, a teacher who believes the theory may interpret ambiguous situations as support for the theory. For example, a teacher might verbally explain to a student—several times—the idea of “borrowing” in subtraction without success. Then the teacher draws a diagram that more explicitly represents that the “3” in the tens place really represents “30.” Suddenly, the concept clicks for the student. The teacher thinks “Aha. He’s a visual learner. Once I drew the diagram, he understood.” But the more likely explanation is that the diagram would have helped any student because it is a good way to represent a difficult concept. The teacher interprets the student’s success in terms of modality theory because she has been told the theory is correct and because it seems to explain her experience. But cognitive scientists have long known that we all notice and remember examples that confirm our beliefs and, without meaning to, ignore and forget evidence that does not. Matt, I agree that it may be unreasonable to expect teachers to also be scientists, but I don’t think it’s unreasonable to expect teachers to be critical thinkers, and to teach their students to be, too. One of the key skills needed as reasoning adults–now and in the future–is the ability to distinguish fact from opinion. If this skill is never learned/taught no one would question any ‘shiny’ claim and thus become easily manipulated and controlled. Wait, I think I just described most of our political and marketing landscape 😉 In learning as in the marketplace, it it important to question as objectively as possible, even when it’s difficult. Awesome Post!! Good research support!! Just wonderful! Hey everybody, this is Will Thalheimer, organizer of The Debunker Club. We are currently focused on increasing people’s skepticism around learning styles. Recently, the top 17 Google Search results ALL leaned toward promoting learning styles. We’d like to get many more of the top search results to share skeptical information about learning styles. First, post the link to Cathy’s blog post early and often. Second, go to The Debunker Club’s resource page (http://www.debunker.club/learning-styles-are-not-an-effective-guide-for-learning-design.html). Third, post The Debunker Club link early and often. Fourth, click on the links in the Debunker Club webpage. Post them too. Early and often. In this way, you can help make scientifically-supported information much more salient in searches related to learning styles. This will, in turn, lessen the number of learning professionals who are basing their learning designs on an ineffective methodology. And, of course, this in turn will lessen the number of learners who are facing ineffective learning designs. The learning field needs all of us to step up and share good information — and debunk myths and misinformation. I absolutely loved your article, Cathy. So glad you wrote it. I personally am an overlooked “nasal” learner. I will promote this in my newsletter and my Facebook page…thanks! Great post Cathy. Cognitive scientist and fellow debunker Daniel Willingham has an FAQ on how to respond to objections which is a nice supplement to your own. http://www.danielwillingham.com/learning-styles-faq.html. There is a smugness to some anti-learning styles posts lately (not yours) which doesn’t help the cause. The science convincingly tells us that learning styles don’t exist. However some practitioners have had success with learning styles or at least some of the more respected approaches like Kolb’s learning styles. I think these experiences should be brought into the conversation but not in the us vs them religious wars tone it sometimes takes. Kolb’s learning approach may work for example, not for the reasons he posited, but because it maps to what science tells us results in effective learning. All of us (not just some of us) learn best when we have the opportunity to apply skills and experience consequences of our actions. So, the concrete experience and active experimentation stages of Kolb’s cycle may not be “learning styles”, but they ARE effective learning strategies. Even learning scientist David Merrill has incorporated elements of Kolb’s cycle (via Mary McCarthy’s 4MAT approach) into his First Principles instruction design http://mdavidmerrill.com/Papers/firstprinciplesbymerrill.pdf. Thanks for the post. I didn’t know there were other “accordion learners” out there. There must be a least 3 other quadrants and associated sub-styles to fill out that learning model. I’m pretty sure I’m an accordion learner with a minor tendency to mandolin. Thanks, everyone, for the respectful comments. Like the many other people trying to clarify the learning style discussion, I’m not saying that people are all the same or denying that some people have challenges that others don’t. It’s also clear that having people experience and experiment with ideas in different modalities can help them learn, whether it’s because one channel works better for some people or the content, or just due to the repetition. “If I were to tell you ‘I want to teach you something. Would you rather learn it by seeing a slideshow, reading it as text, hearing it as a podcast, or enacting it in a series of movements,’ do you think you could answer without first asking what you were to learn—a dance, a piece of music, or an equation? While it may seem like a silly example, the claim of the learning styles approach is that one could make such a choice and improve one’s learning through that choice, independent of content.” — From an article you can read here by Cedar Riener and Daniel Willingham (thanks, Tom Gram and Matt, for sending me to Willingham). I am not a learning styles proponent but do believe in preferences. I found your example of narration intriguing – not sure making the link to self-pacing totally genuine. Self pacing benefits more often come from how a learning app adapts to progression (skipping sections in a program) and how assessment is used. You appear to indicate narration forces one to comprimise? I guess my best example of a preference comes in the form of audio books and embedding this option in e-books. Of course people have different learning styles and even times of day. The comment about pacing was valid. That is why computer learning works is because you can go back over the material. You can go back over book material too, but when the narrator is buzzing right along – you can’t. That is why kids now record lectures – good for them! I am a visual learner – I study pictures – Some one needs to show me math problems slowly – step by step – don’t skip anything so I can see where the numbers are moving and signs are converting. I learn by relating to something I already am familiar with. In reading the text relation is “text to self or text to life” It took me years to really understand how the moon reflected the sun’s light until I was working at Girl Scout camp and we did a thing on the moon for the Brownies. Flash light and a pie pan! Oh! now it all makes sense! I like concepts, I want to know and see how pieces relate to the whole. There are multiple intelligences, learning styles, I maybe a nasal learner – dogs are. The truth is, when you are in a classroom, the best way to present is always – multiple ways. Isn’t it amazing that the captains of industry will talk about going to seminars where they LEARN HOW TO LEARN using multiple mental faculties and classroom teachers are told – DO it THIS WAY- period, no thought, no discussion. What about finding the kids’ gifts that help them. Teaching is not simplistic, learning is not simplistic, Administration and pedagogy are- To many Ph.D’s ( piled higher and deeper) have education ABSOLUTELY NO WISDOM. they are the ones we are forced to model our teaching after and whose ideas we are evaluated by. I write an article ‘the enduring appeal of learning styles’ which was my attempt to explain why this unscientific idea has joined the crowd of zombie concepts that bedevil education. It was published the Australian Journal of Education in 2010. I absolutely love this article. Thank you for writing this! I’d be interested in this as well. Does anyone have any publications they can point to? I’ve taken a look at what appears to be the official 4MAT site, which has a short page summarizing research. The studies that they mention (and don’t link to) describe a mix of improved attitudes about school lessons and some improved performance, which in the summaries isn’t clearly defined. The research summaries are here: http://www.aboutlearning.com/what-is-4mat/research-on-4mat. The same site says that the left and right brains have different roles, which I understand is now a suspect claim. They sell an assessment to tell you if you’re more right or left brained. They also sell a book about how millenials should be taught differently from other generations. From what I saw on a quick exploration of the site, the model is concerned with education (teaching concepts and other information to students who will take a test), rather than changing behavior in the workplace. I have been formally trained in 4MAT for Business (there is a 4MAT for Education as well) and the site you refer to is the Education focused one. That site is run by the founder of the “concept” 4MAT. 4MAT for business on the other hand is run by a different (younger) business partner. Get more info here: http://www.4mat4business.com/what-is-4MAT.php 4MAT for business is basically addressing “learning types” while incorporating learning style items by way of toggling between left and right brain activities/items. In my opinion it does support the fact that learning styles are secondary if not tertiary. In a nutshell, 4MAT for business funnels both the learner and the instructor into 1 or 2 of 4 different categories. I like to ‘dumb it down” like this: 1’s ask Why? This type requires handholding through the learning process. 2’s are the fact checkers. Always asking What? The type that reads their insurance policy word for word and has a pocket dictionary on hand. This is where lecture lives in the learning. 3’s are the How? askers–what I like to call “give it to me in 25 words or less”… cut the fluff, get to the point before you bore me to tears. 4’s are What If? They like to dive right in, try things on for size, ask questions later. By following the “wheel” when developing training and toggling between left and right brain activities for each learning type, you ensure nobody is bored for any length of time. Your VAK’s live within every quadrant but more covertly than overtly. Hopefully this helps—I can’t speak much to the 4MAT for Education but 4MAT for Business has my vote all day whether you’re a Baby Boomer or a Millenial. It helps create a cycle for learning that presents, reinforces and allows each learner to explore at their own pace. Why the rush to debunk, does the lady protest too much? Believing in Learning Styles is a bit like believing in god, so of us do, some of us don’t but no one can prove it either way. Some of us who don’t, used to, and some of us who used to don’t any more and they are often then most evangelical. And those of us who do only do because we were told to as a young impressionable human. I wonder how many people who used to believe in Learning Styles because it was trendy, now don’t because it is trendy not to. But secretly still do because even though it has been supposedly ‘debunked’ it does provide a framework to help us get to grips with the vagaries of teaching. The only harm in believing in learning styles is if we pigeon-hole and label students, but that is the same with any label, digital native for example. Therefore there is no reason to ‘respond to learning-style’ believers, after all I was a believer because of the stuff I learnt on my teacher training courses. 1) rather than trying to provide instruction tailored to an individual student’s learning style, provide a variety of learning experiences/techniques within a lesson. First, it helps the student to see a topic from multiple angles. Second, it could be that one of those experiences/techniques really resonates within the student’s comfort zone maximizing the potential for understanding and retention. 2) if a student does struggle within a lesson and further instruction or coaching is required, having a sense of the student’s learning strengths (possibly a cousin of “style”) may make it easier for that follow up effort to be successful. So…provide multiple ways for students to learn about a topic, and try to reinforce/clarify initial learning in a way which could be most meaningful to a struggling student. This approach not only forced me to think about whether or not my lessons have “experiential roundness” but whether or not I knew anything about my students and their abilities. Both good things in my opinion. Saul, thanks for your common-sense response. It both lets the learners latch onto the technique that works for them, rather than pigeonholing them into categories, and it helps you tailor instruction to each person, rather than to each category. Saul’s design approach would be very rich, if all the children are invited to look at the material in different ways, not only their preferred style. We call this the pinball-machine approach: the longer you keep the ball in the play AND in different ways, the richer the representation in the head (or in modern language: in the brain) of the child will be. Sorry I am a bit late to the party here. 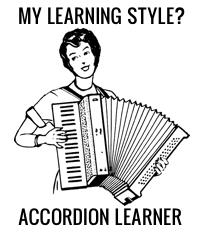 Just a quick question for: are you selling ‘Accordian Learner’ T-shirts? If so can you put me down for an XL – any colour is fine. The t-shirt for nasal learners is under development. We’re having trouble designing a scratch-n-sniff patch that survives a washing machine. Some people are saying here that it’s all just different opinions. Again, what I’m protesting is the claim that the “learning styles” that were created by people for monetary gain should be applied without thought as they are currently applied in the corporate training world. This has nothing to do with opinion or belief; it has to do with science. The people who created the currently most popular learning styles claimed to have research support; they actually don’t. It’s unfortunate that in today’s culture that everything is supposedly an opinion. In the post above and the ones I’ve linked to, we quote cognitive scientists, and what they have is a conclusion, not an off-the-cuff opinion. That conclusion is based on a rational examination of specific claims and testing of those claims under controlled conditions. Obviously research can be poorly designed or even falsified, but the likelihood of that being the case decreases as more and more studies have similar findings. There’s a difference between an opinion and a fact, and the more studies that pile up saying “A is A,” the less that claim can be viewed as a mere opinion. And, to repeat yet again, no one is saying that all learners are the same and that all instruction should be the same. That argument just muddies the issue. The issue is that people are using a formula (e.g. “Use narration for the audio learners”) that has little or no scientific basis, and they’re focusing so much on applying that simplistic formula that they’re ignoring the methods that have much stronger research support. Ironically, the methods that have stronger support actually do a better job of tailoring instruction to the learners’ needs than does putting people into simplistic categories and then tweaking an information dump to “accommodate” the category. What a splendid, well thought out answer. Saying I think students often have a preferred learning style is not the same as applying a formula (“use narration for audio learners”) any more than saying “learning styles have been debunked!” means all students are the same. I’ve been getting questions in private about this, so another clarification: The learning styles discussion here is focused on the VAK styles (visual – auditory – kinesthetic) that are sold by companies that create learning styles inventories. These are the “learning styles” that many clients and designers in corporate training are concerned about. The discussion isn’t about preferences or disabilities. Obviously everyone has different strengths, and some of us have disabilities, all of which need to be acknowledged in instructional design. Again, I advocate for giving the learner as much control as possible, so they can choose the format and pace that works for them. The approach to learning styles that I’ve seen used in corporate training is the opposite of giving the learner control. Designers push information at people without letting them control the pace, and because they over-focus on presenting information, they don’t provide enough of the practice that everyone needs, regardless of their “learning style,” preferences, or abilities. 1. don’t type students and then match learning strategies to their styles: instead use methods from ALL styles for everyone. This is called whole brain learning. 2. Encourage learners tu use unfamiliar styles, even if they don’t like the at first, and teach them how to use these. I was sent this link by my husband – a university prof – because he knows that I talk about L. Styles ( I know, I really mean learning preferences) and that I base much of the work I do on trying to understand children’s learning preferences. There are lots of good comments here so I have been trying to work out why I find them uncomfortable. Then I got it!!! They are all written by academics who teach in higher ed. They are all written by teachers FOR teachers. They all come from a teaching perspective. Comments here seem to agree that it is the SUBJECT that dictates the teaching (and learning? ) style. It is what is being taught that matters, that creates the context in which learners must learn. The assumption that a particular subject demands a particular form of learning is the usual top down approach that I am tired of hearing from ‘academics’. When discussing learning you need to think of learning first and the subject second. There is a difference between teaching and learning that seems to get lost in these arguments. Are you teaching a subject or are you helping kids learn? Teaching – even if you dress it up to appeal to different learning preferences is still that – teaching. If you are interested in learning – then you have to forget the so-called parameters of the subject and concentrate on what is being learned. There are good teacher who TEACH – but they need learners who know how to learn and to learn in the way the teach – pity the poor uni students who learn differently and who haven’t been taught how to learn anything, from anyone, at anytime. There are good teachers who help kids learn – by looking at their subject as a means to an end rather than an end in itself. The end being helping kids learn how to learn. They are learners focused not subject focused. Thank you for your comments. It is possible to teach the subject by style AND help the student learn. However, we must teach students how to learn in order for this to work. There have been a few mentions in the blog post and in the comments referencing the book “Make It Stick” by Brown, Roediger, and McDaniel. They reference only one sentence out of a 336 page book. The book is based on research and empirical evidence with regard to learning. It was refreshing to read a book on learning evidence and not the usual learning theory. I encourage you to read the book. It was certainly eye-opening for me. I think you will enjoy the read. I have it on good authority from no less than @TheWeirdTeacher that while learning styles have been debunked we (as designers/teachers) have to mix up how we present the learning experience. Engaging learners via hooks from their contexts and interests (see @BurgessDave) and giving them authentic activities and assessments (that make their learning visible) go a long way towards meeting learners’ needs. Wonderful article, well researched and clearly explained. Recently, I came across your blog while I was searching for blogs and websites on instructional design for an instructional design course I am taking through Walden University’s Instructional Design Certificate Program, and I was taken by how engaging and well-thought out and put together your website is. I was immediately drawn to your title that proclaims “Let’s Save The World From Boring Training!” I found myself nodding my head yes and responding with yes, I want to save the world from boring training. I want to design engaging, dynamic, and relevant learning platforms that make learning both effective and enjoyable. While you seem to be involved with the setting of business and industry and I am currently involved in the environment of education, I am still able to apply your perspectives and techniques. In fact, I just watched your You Tube video on the action mapping method you developed and it addresses all of the areas I have just study in my course. Specifically, I am studying how the human brain works in regards to learning. I just read about encoding and have been taken by how to store learning into long term memory learners must encode information by applying influencers, like meaning and organization to the material to be learned (Our textbook authors, 2009). In your You Tube video, you shared that the goal of your action mapping method is to create a meaningful experience rather than an informational experience. This resonates with my learnings of encoding and how the brain remembers (long term) what is meaningful, relevant, important, and useful to the learner and discards all other information that does not meet this criteria ((Our textbook authors, 2009).. Your action mapping method strikes me as directly following the process of encoding. Ms. Moore, am I correct in coming to this conclusion? In this You Tube presentation, I noted that you incorporate meaning through narratives that stimulate the senses and apply sensory registers (Our textbook authors, 2009), thus bringing the information contained within the scenarios to life for learners (You Tube Video). The famous author, Natalie Goldberg states in her book entitled Writing Down the Bones that “Our stories are important” (p.149). Would you say that learners connect with the narrative medium because the narrative is grounded in a schema that learners recognize and thus can connect and apply new information to this old narrative schema that they already know so well? Additionally, I would love to ask you what you are currently working on in terms of improving as you “re-design” learning instruction for learners? I admire your innovation and your drive to invent and grow new learning methods. I thank you for your time and your engagement. Goldberg, N. (1986). Writing down the bones. Boston & London: Shambhala Press. Great blog post Cathy! I used to teach learning styles and had my students fill out a learning style profile at the beginning of the semester. I believed that by mixing up my teaching and instruction methods that I would be able to reach all learning styles. What I discovered was that by labeling the learners this encouraged them to resist certain exercises that didn’t align with their learning style. Unfortunately, it created too strong an emphasis on the label and not on the learning. When I realized this, I started asking all students to focus on what they learned in the lesson for the day and what their responsibility to the learning outcome was. This shifted the focus from being instructor centric to self-regulated and more self-motivated. In this UMass Dartmouth post it still covers how to teach to different learning styles (VAK). All of these tips are still great ways to differentiate teaching. I would ask, if you had a classroom that was entirely made up of auditory learners, would use only use those methods? That would be a disservice to the learners. We need to worry less about labeling and more on making teaching and instructional design interesting and varied, giving adult learners options. I must admit I am still a fan of Howard Gardner’s Multiple Intelligences . I believe his work often gets confused with learning styles. This article in Edutopia, covers the differences well and outlines what is essential to reach the wide variety of students in our classrooms. This summarizes my newer approach in the classroom. I would love to hear what approaches others use to reach the widest variety of learners. Gardner, H. (2006). Multiple intelligences: New horizons (Completely rev. and updated. ed.). New York: BasicBooks. I believe this is very important when deciding how to teach somebody. It has been proven many times that if you sustain a better relationship with the learner they will engage more, learn more and ultimately, it is far more productive to meet the learner’s needs if possible because you will get the best results. I think it’s important to separate learning styles from VAK, and VAK from the ‘meshing hypothesis’. All too often they are conflated and the discussion, in my view, gets very confused. I was a learning style advocate for a long time. Your article has made it easy to help people transition to a new way of using learning styles – one that focuses on what is appropriate for the content rather than the individual. It also makes sense to incorporate more relevant practice exercises to help learners. Thanks for this informative article. I’m glad I read through the comments section; some helpful insights – and Cathy’s responses did answer a couple of my questions. I thought her strategy for approaching learning styles ‘believers’ by focusing on the evidence and avoiding challenging their core values is perceptive and practical. It’s certainly likely to be more effective than an all-out challenge. Cathy, you make it clear that the focus of this post is on the ‘moral panic’ appeal of the VAK model. But what about those who read the research evidence as saying the jury is still out on learning styles in general? I don’t see learning styles as a myth that’s been debunked, but nor do I have any emotional investment in the construct. Where do I fit into this framework? I think one clear misgiving in the learning style conversation is the implied assumption that learners only learn through their dominant style. One may learn more effectively through audio input, but that doesn’t mean the visual style doesn’t come in as a close second. Strength-based research implies that our strengths all work to connect us to our world, and multiple strengths abound in each individual. Therefore the most dominant strength is not the only strength, and thus other strengths can also help our ability to interact. Thanks for this article. Teaching developmental courses at a state college, I’ve found the learning styles myth to be outright harmful. Many students truly believe they are incapable of learning anything not presented in the student’s preferred learning style, or it will be very difficult and attending class won’t help them much. Plus their is the oh so tempting implication that failing is never the student’s fault, but the instructor’s for not teaching to the student’s style. It’s hard for students to understand that the publishers who produced those inventories they took in middle and high school are multi-million dollar businesses whose primary purpose is to make money, not to educate. My impression is that the more a student struggles in K-12, the more they will be exposed to the learning styles myth as it makes it look like the school is doing something to help. This is–to put it briefly–amazingly well done. So much so that I am going to use it every chance I get. That is intended to be a compliment. Great post Cathy! To answer your questions, based off my own experiences, I have found that I must incorporate many learning styles and pay very close attention to the information I am trying to process in order for me to retain it, and in return, remember the information later on. No matter the environment I am in, I must make sure the information I am trying to process sticks out somehow in order for me to store it and be able to recall it. I usually have to associate the information to something I already know by the use of personal association. Visually, I picture my brain as a library that stores new and current information. All the information learned are the books in the library. So, if I don’t place the new book in the right section of the library that is relative to the old books, it may be stored in my LTM, but difficult to retrieve from being placed in the wrong section. Therefore, I must attach new and old information to be able to quickly retrieve information. Sometimes, I have to incorporate all my learning styles and use several learning strategies in order to remember simple information. I have learned that I must adapt to my environment and how information is presented to me. I have had to be flexible in my working field to make sure that I interpret instructions correctly. I believe there are a number of ways in which we store information in long-term memory. There’s not just a single way. I believe learning styles are still popular due to those that are morals or so that, socially, people can be more at ease in having a generalization in how most people learn or find ways to connect a better understanding about themselves. It seems as though people want to learn more about themselves to have a better understanding in why they are the way they are and use that as validation. When faced with a colleague or client who wants to accommodate learning styles, I merely ask them what has worked for them in the past and we narrow down strategies that will help all areas instead of focusing on just one learning style. I explain to them that they are like a fingerprint or snowflake in which no two is alike and they are unique just as they are unique in how they learn. Cathy I greatly appreciate this post! I am of the population that was taught in college about teaching to meet the needs of different learning styles. Now after reading more about different learning theories and research such as what you posted, I have come to believe otherwise. I definitely can see the appeal of the “learning style” theorists, it did help me be more aware of using a wide range of methodologies to present content. However, looking back it may not have been the most effective way to transfer that knowledge because I was catering to the preference of the learner. I think in this day and age it’s typical to hear that many are “visual learners” and so on just because we are bombarded with so much visual stimulation that it may seem necessary in order to keep our learners’ attention. Now that I have been scripting for trainings and working collaboratively with instructional designers in my virtual school, I have realized the importance of the content and nature of the task driving the medium that is to be used. I think it’s also important to keep in mind what strategies will be most effective in the retention and recall of the information presented. I find that opportunities for active engagement in the learning process such as discussions, scenarios, self-pacing, flipped classroom models, etc stimulate the audience and create for a more memorable learning experience. As you mentioned to, learning styles became popular also for the simplest of all reasons, the driving force of the universe it seems- MONEY. Making instructors now have to cater to different learning styles meant investing more money in making sure you had the means to present lesson in audio, visual, kinesthetic, and every other form to fit these styles. The entire topic almost seems as illogical as the heated debate of common core standards (but that’s an entirely different blog rant  ) When can I place my order for the scratch and sniff t-shirt for nasal learners?